It all started with a murder. Two victims lay dead at the hands of Peter Dawes, but what laid in wait for him was not the sound of sirens or the banging of a gavel. It would turn a doctor into a killer and a man into a monster. Follow Peter as he exchanges his blood-stained clothing for tailored suits, his scalpel for fine-crafted daggers, and is reinvented as the newest vampire-child in a coven of decadent sophisticates. He even takes on the name ‘Flynn’ – a child of red – in honor of his new-found devilish side and to further distance himself from his human past. 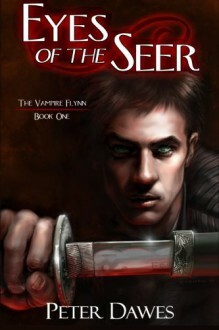 For four years, Flynn embodies every bit the bloody immortal he was sired to become. Under the reign of his maker, Sabrina, he establishes a reputation as the most feared assassin to ever terrorize the covens of Philadelphia. But the surefooted-steps and quick hands that make him a virtuoso when it comes to killing humans and vampires alike are attributes of the mortal destiny which haunts him even beyond death. And despite all efforts, Peter’s humanity is not as dead as some would prefer. On the verge of completing their vie for power, Sabrina’s ‘dark-killer’ will suddenly find himself conflicted when an impish sorceress named Monica awakens the hidden powers he was fated to possess. In this world of macabre and shrewdly practical immortal beings, will Flynn’s supernatural gifts be used to orchestrate the wicked deeds of his maker? Or can the cold-blooded nature of a vampire be warmed by the compassion of a Seer?